TSALKA, DFWatch–Tsalka is a cluster of villages in the south of Georgia. It is home to ethnic Armenians, Greeks, Azerbaijani and Georgians; most of whom are eco-migrants from the Adjara region. Levon Akopian, an employee of the local government who is from the village Chivtkilisi tells us that most of the Armenians came to Tsalka in 1828, during the Russo-Turkish war. They came together with Greeks and mostly originate in Kars, Turkey. Armenians today number about 5,000 in this region, spread out in 13 villages. 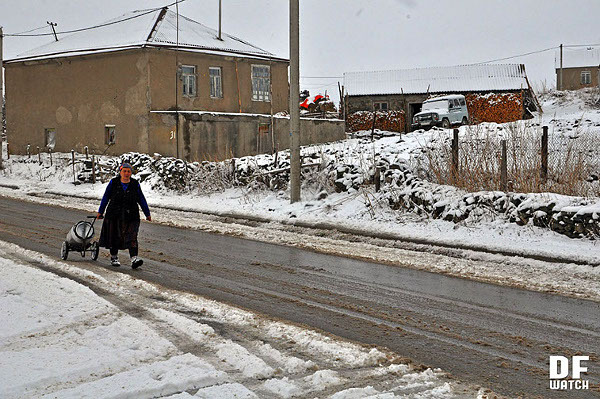 There are four Azeri villages, while about 1,500 Greeks are still living there, having mostly emigrated in the 1990s due to political instability. Levon says most of the Armenians in Tsalka are doing fine compared to Javakheti, where Armenians have problems with getting employment and residency permit. “I think we have no such problems here. We feel fine compared to Javakheti. Everything is nice and peaceful in Tsalka,” he says. Grigori Elisbarov, from the village Trialeti, agrees with him. He says the Armenians in Tsalka don’t have any serious problems, but this year people couldn’t sell their potatoes, which is the main source of income for a large part of the population here, not only for Armenians but others as well. Potato is the pride of many living here. It is called the ‘mtsvadi of Tsalka’, we are told. (Mtsvadi is barbecued meat.) Usually, the potato production is exported to Azerbaijan, but this year Azerbaijan didn’t buy potatoes from Georgia. The Agriculture Ministry’s representative in Tsalka (there are such offices in all municipalities) tells DF Watch that Azerbaijan purchased potatoes from Ukraine at a lower price. This means people had to sell their harvest here in Georgia, where the annual potato production is about 70,000 tons, on average. “Armenians here grow potatoes or keep cattle. What else can we do? We cannot sell potatoes this year. No customers,” Levon explains. 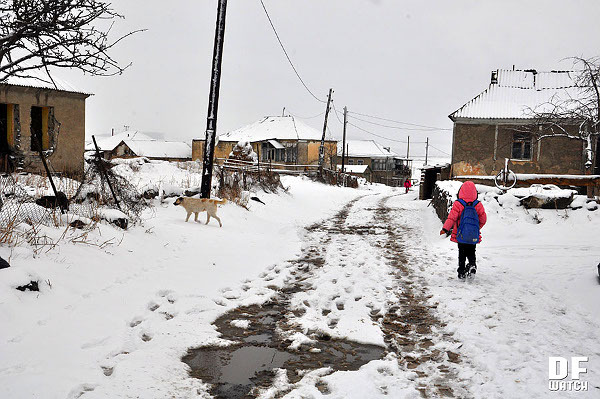 Grigori also explains that the weather of Tsalka is tough compared to other places, where farmers already sell herbs now, while there is still snow in Tsalka. So people choose to have potato or have a cattle to sell milk or milk products. Several big local companies like Sante and Ecofood have branches in Tsalka. There are four milk producing plants there and 12 points where locals deliver milk for processing. About 50 tons can be brought to the plants per day in summer. 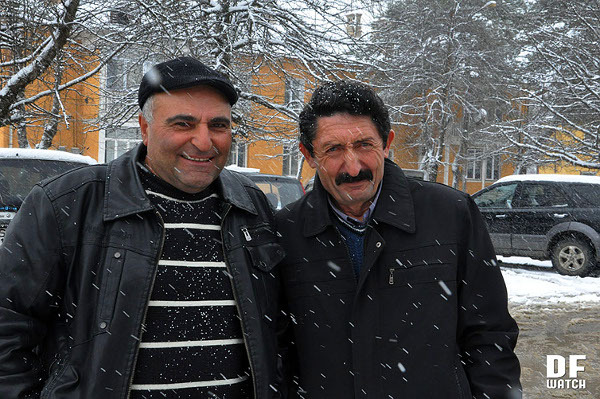 Both Levon and Grigori say that if Armenians choose to go they don’t go to Armenia, but prefer to go to Russia to look for work. “Who wants to go to Armenia? You know they are in a worse situation than Georgia,” Grigori says. Unlike other Armenians in Tsalka, Grigori came from Akhalkalaki in 1941. He said that there was a German village there, but the Germans were deported to Kazakhstan when the war started. The village was empty. Now he lives in the village Trialeti with other Armenians and eco-migrants from Adjara. There are about 50 Armenian families in that village and many more Adjarians. For many people, particularly elderly, it is a problem not knowing the Georgian language. Most of the children study Georgian now. In Armenian villages there are Armenian schools and Georgian is taught there as one of the subjects. As a representive of the local government, Levon says that most of the villagers come to ask to fix the roads or water. Some ask to help with selling the harvest.